10% off at the TNW Deals store this weekend! 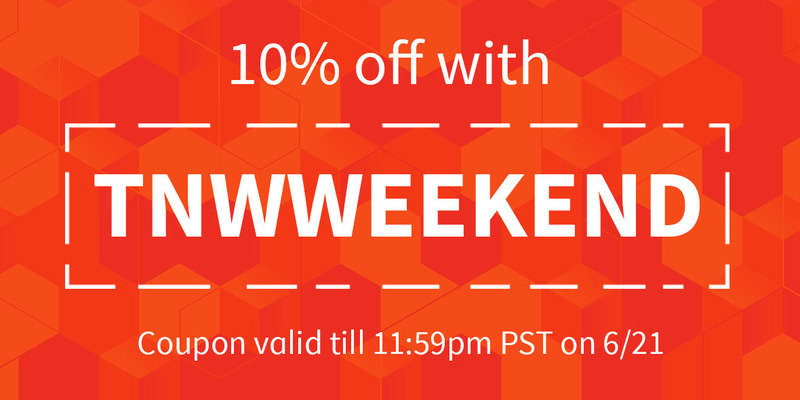 For this weekend only, you can get 10 percent off everything over at TNW Deals by entering code TNWWEEKEND. The coupon expires Sunday 21 June at 11:59pm PT. To give you a taste of what you could be saving on, here are some of the week’s best deals. Knowing how to code is both a life skill and a career opportunity, and this bundle of courses is designed to give you an all-round education. Using your phone while driving is a dangerous hobby unless you have some place good to put it. The ExoMount Touch has a suction cup that you can mount with one hand, and a head that swivels through 360 degrees to the ideal angle. The suction cup is also incredibly grippy — it works on flat, curved, smooth, and textured surfaces — while the mount itself is compatible with virtually all smartphones. You can order it now for $19.99 with free shipping. The Sound Kick is only 1.6 inches thick, but it sports stereo 2.3-watt drivers which produce great sound quality. This is further enhanced by UQ3 spatial technology and natural bass response, and the speaker can keep going on battery for seven hours of playtime. Music is fed in wirelessly via Bluetooth, and the USB port at the back of the Sound Kick lets you charge your phone. You can currently pick it up at $49.99 with free shipping. And remember, you can get an extra 10 percent off everything until midnight Sunday.